Cancer Biology: Bye, bye, baby... Too much radiation for our children? Bye, bye, baby... Too much radiation for our children? Full body X-ray, or "babygram"
The other day, I was perusing the Health section of the New York Times and a small box in the corner of one article caught my eye. It was a link to a series called Radiation Boom, which showcases a number of articles that examine “issues arising from the increasing use of medical radiation and the new technologies that deliver it.” Since my project involves some examination of the later health problems that arise related to types of cancer treatment, with radiation being one, I thought this might be an interesting series to take a look at. Looking at a handful of these article titles is enough to make you stay away from x-ray machines for life. Radiation Worries for Children in Dentists’ Chairs, After Stroke Scans, Patients Face Serious Health Risks, Radiation Offers New Cures, and Ways to Do Harm—you don’t even have to read the article to be persuaded by the overwhelmingly negative tone among the titles that suggest radiation is bad, bad, bad. I decided to take a closer look at the most recent article, X-Rays and Unshielded Infants Raise Alarms. According to this article, children are being unnecessarily irradiated due to disregard to both proper protocol and common sense. Considering the health risk radiation poses, there are simple standards that trained technicians are obligated to uphold in order to protect both themselves and their patients. It seems that care for the latter—particularly in the cases of babies—has come under scrutiny more recently as a SUNY Medical Center in Brooklyn was discovered to have been performing “babygrams”—the moniker given to whole body X-rays performed on infants. Whole body scans? You aren’t the only one justly concerned by this statement. “This poor, defenseless baby,” said Dr. Sclafani, a SUNY radiology department chair, upon hearing of one infant enduring ten full X-rays. “Full, unabashed, total irradiation of a neonate,” he described it . Alarmingly, another doctor at the same hospital found that this baby’s situation was not all that unusual either,s and that “that full-body X-rays of premature babies had occurred often, that radiation levels on powerful CT scanners had been set too high for infants, [and] that babies had been poorly positioned” . When I first read this, it was easy to get worked up by the fact that this was occurring in hospitals. But then I thought, “Well, maybe I am overreacting”—if it has happened more than once and these technicians performing the procedure are properly trained and aren’t worried themselves, maybe it really is not as bad as we thought. Wrong. Here’s what else I found after a little more research. In a study done in 1999 (admittedly, dated), Professor John W. Gofman at UC Berkeley attributed a significant number of cancer and heart disease deaths from previous medical radiation. I would have to do a little more digging to see if 50% of cancer deaths and 60% of deaths from heart disease are actually attributed to the accumulation radiation as this study claims (which I find doubtful, though, very alarming if it could be verified), but other studies have at least confirmed these speculations in general . A five-year study featured in ScienceDaily in 2005 found that even a small amount (zero to 100 milliSieverts—please, don’t ask me to try to explain what those units mean) of radiation can increase cancer risk; "There appears to be no threshold below which exposure can be viewed as harmless," says Herbert L. Abrahams, a radiology professor at Harvard and Stanford . More importantly, though, the study also found that radiation in the first year of life for males increases one’s cancer risk three to four times than a similar dose given as an adult. Female infants’ risk was double that of males. That sounds like a pretty convincing excuse for why infants in particular should stay off the X-ray table. Age seems to be such an important variable to consider because of the rapid growth we undergo as children; logically, it makes sense that with a greater number of cell divisions occurring, there is similarly a higher risk for something to become mutated because of radiation. I believe this risk can only be generalized to “the more radiation a patient receives, the greater the chances of developing cancer” as the article suggests is possible if all parameters are considered. If age is a strong factor example, could it even trump dosage? If the effects of five radiological events before age 18 is greater than five radiological events after age 25, it doesn’t seem that far-fetched that the five exposures before 18 may still be even greater than 7 or 8 exposures over age 25. That would be an interesting study to propose. There is an overall consensus that the effects seem to be cummulative, yet the patterning of when the events occurred in one’s life seems to have great significance, as well . And, yet, the youngest of our patients are increasingly facing a greater number of X-rays; one source even says the average child will have had more than seven by age eighteen (unfortunately, the article doesn’t cite what study this came from, so we can’t determine how legitimate this claim is). So, again, why is this happening? On one level, it is simply because it has radiation has increasingly become a great way to detect medical problems and trauma. But it goes beyond the science alone and often comes down to the technician’s competence and human error. 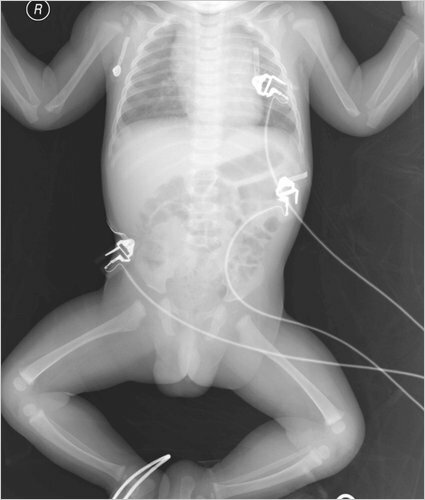 Whether it is being afraid of hurting fragile bones, sheer laziness at shielding sensitive parts of the body (like genitalia and breast tissue), or being in a hurry to see multiple patients, improper X-raying procedures can expose the infant to high levels of radiation directly, in radiation quantity, and indirectly, by producing a poor X-ray that might then require a retake. This is one reason why so many people argue there needs to be a greater emphasis on training X-ray technicians. Some are even lobbying Congress to pass the CARE bill which would establish national education requirements for positions that perform X-rays on patients, since currently it is decided on a state-by-state basis, meaning it is unregulated in some states (as radiation therapists apparently are in 15 states) . The bill would require everyone to obtain a certain level of certification and follow up with continuing education requirements. What do you think the next step should be in controlling radiation procedures and implementing standard precautions? Could there be negative ramifications of such a bill? I, personally, don’t see any. To me, taking precautions does no harm. Even if we didn’t have the aforementioned evidence, wouldn’t the chance to save people down the line outweigh the costs of the time it took to enforce those precautions? Bogdanich, Walt and Kristina Rebelo. “X-Rays and Unshielded Infants.” The New York Times, 27 Feb 2011. 27 Apr 2011. <http://www.nytimes.com/2011/02/28/health/28radiation.html?_r=2>. Sanders, Robert. “Radiation expert warns of danger form overuse of medical X-rays, claiming they’re responsible for many cancer and heart disease deaths.” Public Affairs, (510) 642-3734. 16 Nov 1999. UC Berkeley. 27 Apr 2011. <http://www.berkeley.edu/news/media/releases/99legacy/11-16-1999b.html>. Stanford University. "Even Low Exposure To X-rays, Gamma Rays Increases Cancer Risk, Study Finds." ScienceDaily, 27 Oct. 2005. 27 Apr. 2011. <http://www.sciencedaily.com/releases/2005/10/051027090539.htm>.